I really don't know how to better describe the events of yesterday's fishing trip, except to show a few pictures. I believe that they will tell it all. In the end, I decided that I need new fishing gear... Knee guards...or just better judgement. Minus the hocky stick, of course. ﻿﻿There is this term called "Combat Fishing"...it usually relates to the density of fisherman on the river. 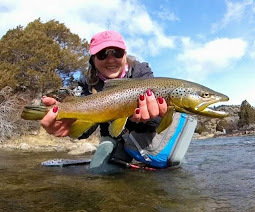 But, in my case, it means...one River Damsel in a stretch of stronger current with one 20 + inch brown trout. (You will have to forgive the missing picture of the actual battle...needless to say, there wasn't time to take a few pics! 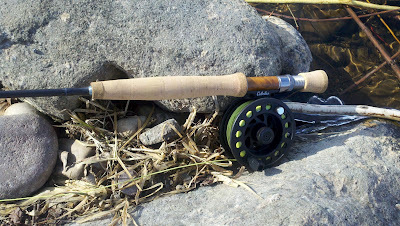 but, because I left my Lamson reel at home, the low cost back-up had to be used. 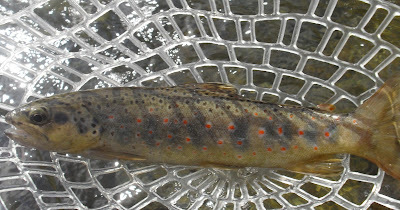 The first catch of the day was this "teenager" of a Brown Trout. 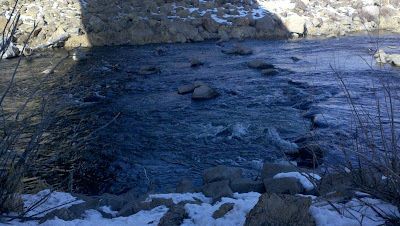 Then, I had it in my mind that there would be bigger fish down by the bridge. 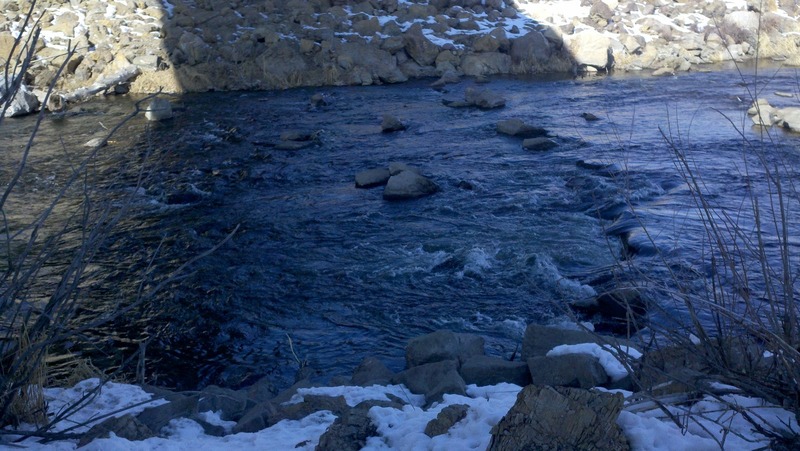 Then, this is where the story goes...downstream!! In more ways than one. Mr. Brown...broke off. Insult to injury! : ( Well, at least I saved my line, I guess! I have one of those reels that I fish from time to time. I've always thought the drag didn't matter cause its purpose is just tonhold the line. Maybe I better reconsider. Great tale. Good luck with those knees. That is definately Combat Fishing, just a different phase. Guess it wouldn't do to yell at you about safety. Just glad you're OK.
Mark ~ You are absolutely right on that one! I really wish that this could have been one of those fictional stories that Howard writes up... : ) Lesson learned, I guess! Good story and good advice. 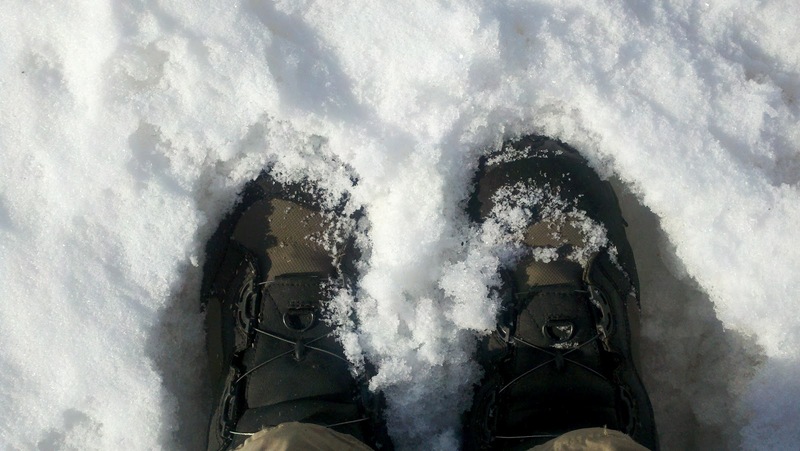 Breathable waders should definitely have reinforced knees and other areas of stress and wear. I would have thought Patagonia would have made a more durable product. Spurky ~ All I can say is that I am a "comeback kid"! Mr. Brown won this round...but, there will be another battle standing upright! Jay ~ If these can't be fixed, I will be saving up for some lower end Simms...I really like their reinforced knees. But, we will see what the patch system can do for me first. Great story...sorry it turned out like it did. Knees will heal, the waders should be able to be fixed. (don't forget to call Patagonia first to see if they'll do a pro repair, cheap)bruised ego will fade. Three questions. Didn't you check your drag when you got the reel? Will you ever forgive me for the smile on my face right now? And third, were you wearing your fleece? Howie ~ Now, let's start with the fleece. 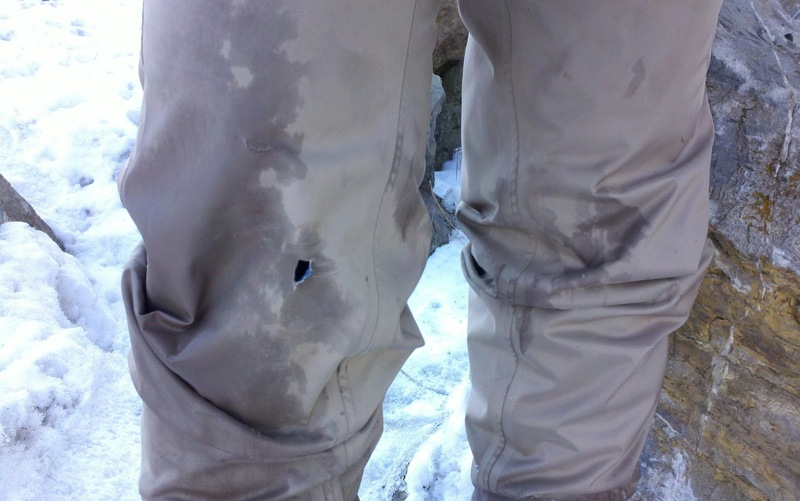 And why it is a smart thing to wear under your waders...besides warmth, they did protect me from worse injury because of the extra cushion. In fact, they even soaked up the one dab of blood. 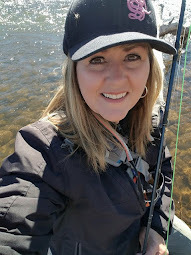 : ) The drag on this reel has only been tested for small brookies, so I thought everything was fine from the original setting. But, now that I have tried to adjust...it doesn't do anything! And, yes...I deserve that smile. Nothing to be embarrassed about! Nothing at all. That's something you'll never forget! Sure, it would have been better (in some ways) if you'd landed him, but just knowing you fooled him and had him on is awesome! 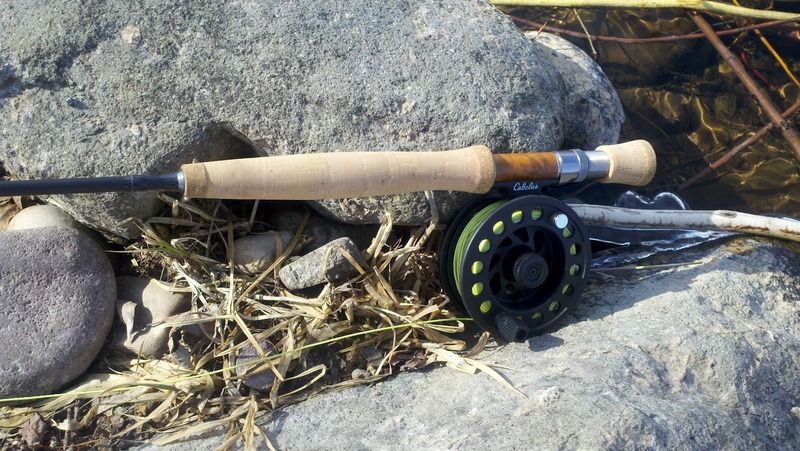 On the reel - it's got a drag or just a clicker? I've seen reels with clickers that had a "drag knob" and I never have been able to figure out why?! 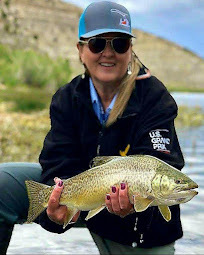 If you're going to be taking on fish that big, I'd say hang on just a little while and I'll let you know how the drag is in the new Wind River reel. I doubt we'll get much on it tomorrow - but in the weeks ahead, I should have some bass put it through it's paces! Glad you are relatively ok! Sorry knees! Owl ~ I have been pretty happy with my catches on soft hackles as of late... Sigh... No clicker. It is a disc drag. Maybe I will hang on to it a while longer until you do a full review on the WR...then, exchange. Thanks, Owl. Ouch! But this one you'll remember for years to come and that patch will be like a cool scar. Glad your okay! I'll take all the mishaps and the agony for a chance to tie into a brown like that. 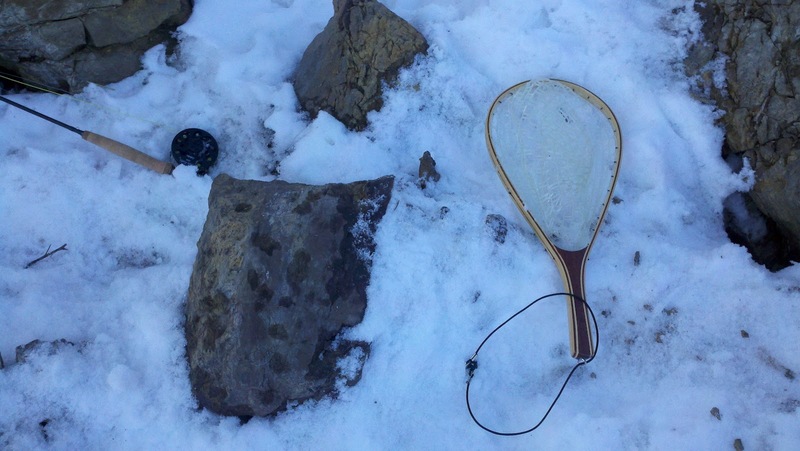 Heck I might even take a broke fly rod instead of a bum drag system. You are due for a reprieve. Glad to hear you are OK. Icy water is a scary thing when balance fails. Sorry about the waders! I've heard patagonia is really good about helping fix/replace equipment if you decide to send it back. 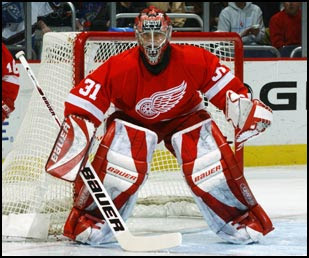 I played goal for the hockey team in college and I can tell you, sometime it doesn't matter how much or what kind of equipment you have on. Sometime you are going to come away bruised one way or another. it sounds like you managed the situation very well considering the circumstances. Good luck with the patching! Kevin - I am just hoping that this cool patch is the only one I get for awhile! Lol. Mel - Maybe it's time that I start being a little more picky! But, when I see the river, something just comes over me! No more risks...I promise! Matt - Balance in any kind of water is tricky, hence I got some new studs for my boots! And they have been awesome. But, nothing was going to help this time with the moss underneath and that fish pulling like a freight train! I think that sounds like a truly epic battle! 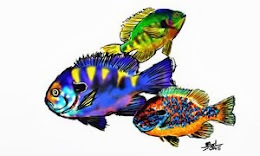 Generally people say they caught a big fish and it put up a great fight, but how many of them can actually say the fish fought so hard that it made them bleed?! I think you have set the new standard for what it takes to call it an epic battle. What was the fly of choice on that big brown beast?? Bruised knees and egos...sounds like a typical day on the water for me...ha! sometimes it just isn't meant to be. 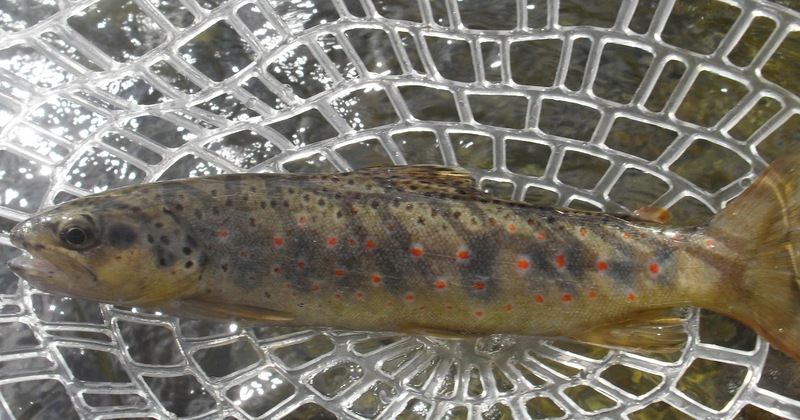 One day a trout has you 150 yards downstream, the next he's resting comfortably in the bottom of your net. Glad you came out of it alright, could have been worse. RMNP FRENZY II...In The Works!